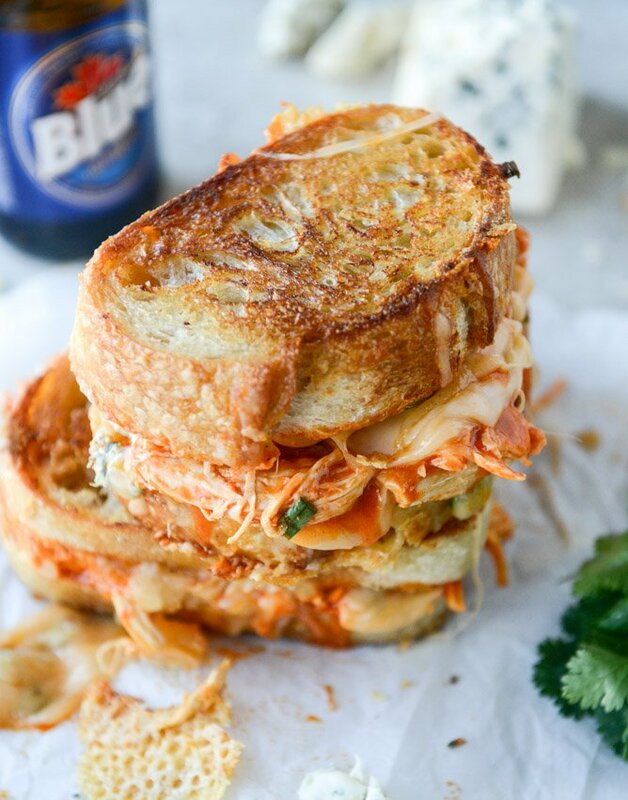 It’s basically a crime to not consume buffalo chicken this weekend, am I right? If you’re not eating something with wing sauce this weekend, I don’t even know you. Isn’t it a requirement? I think it is. Not quite sure that I’ll be doing the whole super bowl thing, but if we’re in our circle of trust here then I don’t think it’s a secret that I’m only in it for the FOOD. Yep yep. I’ll cuddle under a blanket with a fire roaring and eat all the dips. And judge all the commercials. Speaking of: can we talk about the Rob Lowe direct TV commercials? I laugh out loud. For real. Is this what my life has become? YEP. I’m a bit wacky over the buffalo combo – preferably without chicken, but whatever. 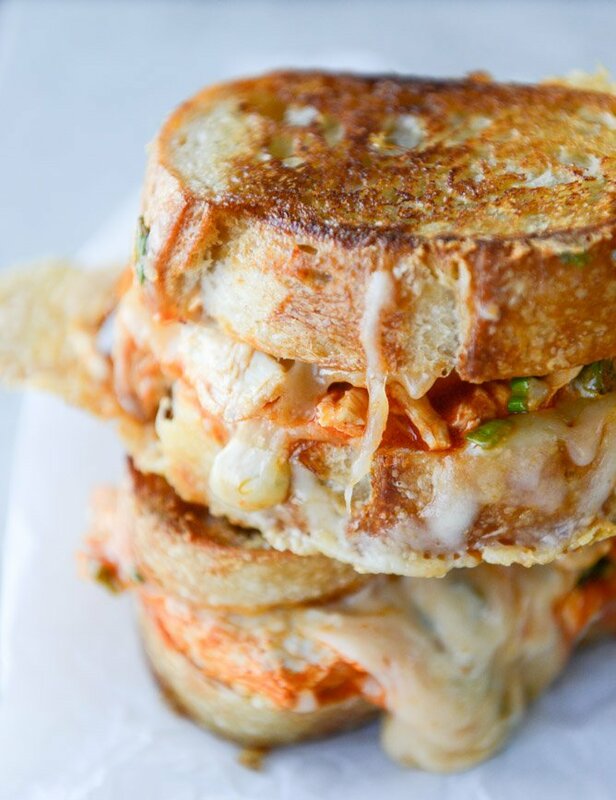 It should be noted that this sandwich thrills me with just the four different cheeses (YES) and wing sauce with butter. Practically a crime. 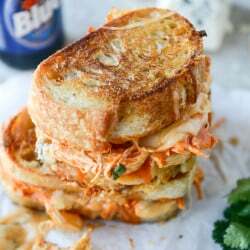 While I don’t find buffalo chicken grilled cheeses(us) to be very original these days, this recipe has been in my arsenal for a loooong time. Almost a year ago, I taught a grilled cheese class (yep that’s a thing) and this was the winner of the night. I shared this picture that evening but never got a chance to share the recipe, besides in a few emails when you guys asked. 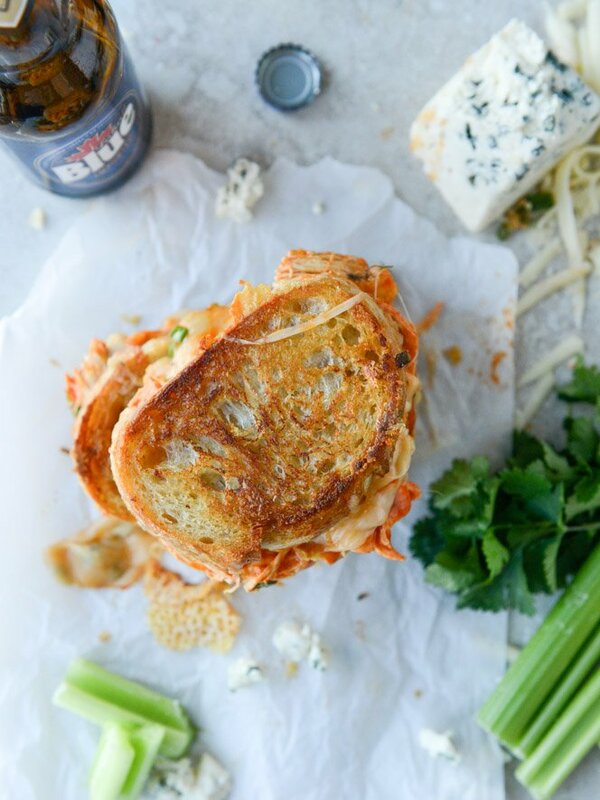 My take on buffalo chicken and the use of different cheeses, butter in the sauce and green onions are what gives it my ideal buffalo flavor. 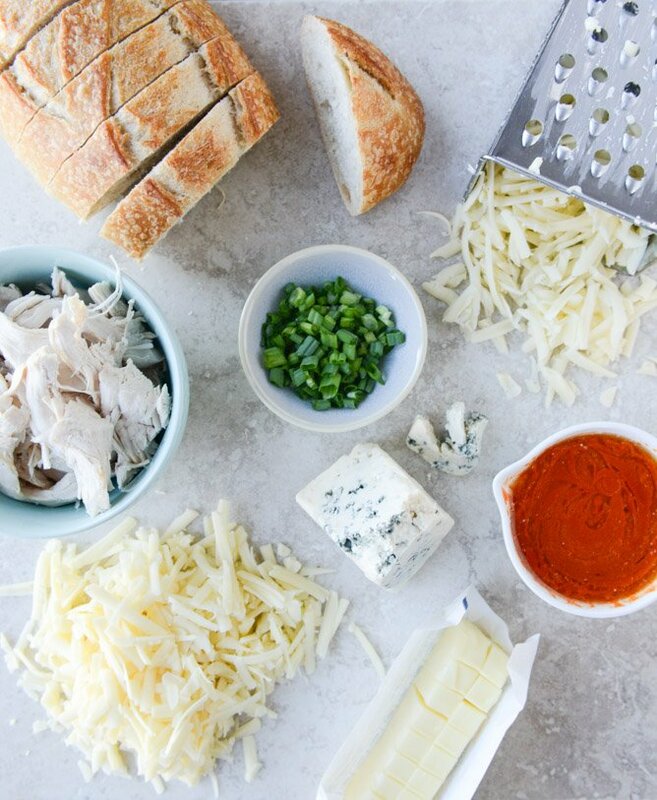 It takes some fontina, white cheddar and your favorite version of blue cheese – mixed with wing sauce, a teeeeeny bit of ranch, BUTTER (this is key! ), green onions or chives and cilantro if you’d like. That whole combo is buffalo flava explosion. It is. In this case, I’m taking it up a trashier notch. I mean, buffalo chicken is, like, one of the trashiest foods there is. Good trash, obviously. If I want to trash something up, it’s going to be buffalo… ized. Yes. I just verbed it. This extra love here comes in the form of a beer cheese sauce/fondue, which I first made in another grilled cheese: beer cheese meets pulled pork. I always use cheese on the tops and bottoms of the sandwich to act as “glue” – so in this case I smother some of the chicken mixture in the middle with the melty beer fondue. Also, it’s worth noting that I sort of wanted to throw potato chips on the sandwich too. I’m no longer pregnant and am creating some of the weirdest junk known to man. Not that potato chips on a sandwich are weird by any means, but I thought that may be a bit over the top. If you’re so inclined though… send me a pic of that mess. 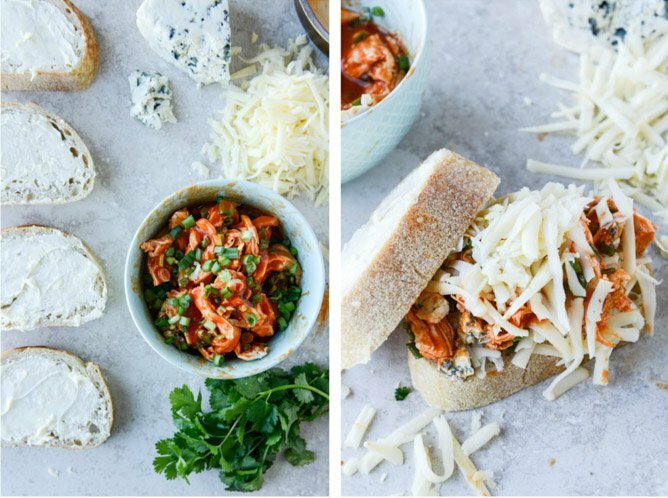 If you’re wanting other “buffalo wing” recipes, these 30 minutes buffalo chicken French breads KILL me. So dang good. I’ve done buffalo chicken tacos, buffalo chicken soup, baked buffalo chicken pasta and buffalo chicken salads. I’ve made buffalo chicken enchiladas and creamy stovetop buffalo chicken shells. I even made buffalo quinoa sliders (sans chicken) with sweet corn and… ugh. Fabulous. My all time FAVE buffalo chicken pizza is in my book. AND! These crunchy buffalo chicken oven fries. Flash back to when I WAS pregnant, I made those three times in one week. They were all I wanted. It was so weird. I could totally still eat them thrice a week though if we’re being honest. Who has a buffalo problem? Raise your hand. In a bowl, combine the chicken, wing sauce, ranch dressing, melted butter, green onions and gorgonzola, and stir to combine. Heat a large skillet or griddle over medium heat. Spread the outsides of the bread with softened butter. To assemble the grilled cheese, place a slice of bread butter-side down in the skillet. Add on a few handfuls of fontina and cheddar cheese, then top it off with a quarter of the chicken mixture. Add a few spoonfuls of the melty beer cheese. Add more grated fontina and cheddar on top, followed by another slice of bread, butter-side up. Cook until the cheese is melty and each side is golden, about 4 to 5 minutes per side. Serve immediately. OMG, your photos are so bright and beautiful!!!! I just want to be eating this right now, Chef!! Hi, Jessica, I found you! 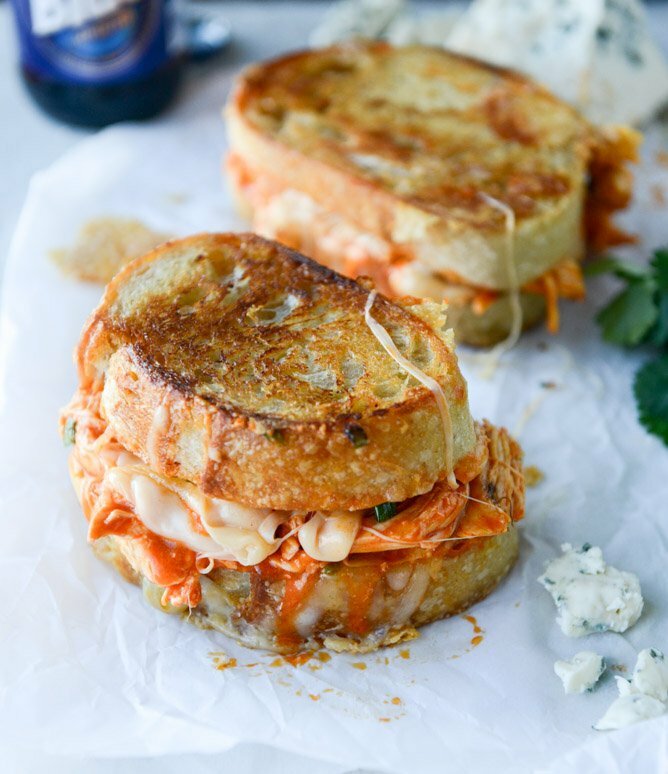 I randomly found your blog and came across this buffalo chicken grilled cheese with beer cheese recipe, It looks yummy, and I will definitely give it a try, thanks for sharing. Tasty! My mouth is watering.